Mamma Mia! Here We Go Again is a surprisingly strong sequel to the fizzy original. Getting the bad out of the way, the film feels the loss of it’s A List cast from the original, the majority of them appear but with limited screen time. Lily James carries the majority of film as the young Donna and she’s more than capable. I do wonder if they asked Grace Gummer, one of Streep’s daughters, to play the role since she bears such a striking resemblance to her when she was younger. Still Lily James pulls off an impressive performance, capturing most of Streep’s mannerisms from the original film. The rest of the younger cast is equally as effective portraying their older, legendary counterparts. The song selections here aren’t as strong as the original film which is understandable since the original used nearly all the greatest hits. Still they are catchy enough to keep any ABBA fan smiling. 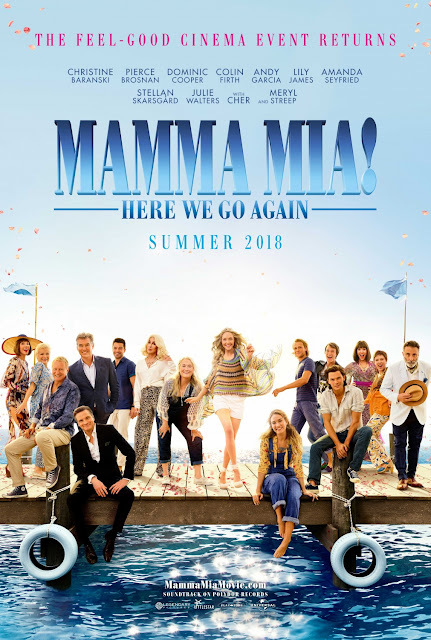 The strangest thing about Mamma Mia! Here We Go Again is how reflective and heartfelt the film is. It’s far more emotional than you’d expect from a sequel to a light fizzy original. Meryl Streep appears in what is an extended cameo but her appearance packs an emotional punch and really brings the film full circle.